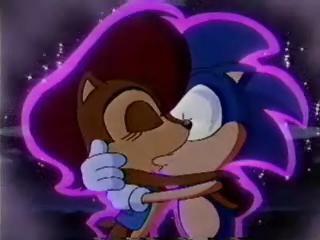 sonicXsally Kiss. . Wallpaper and background images in the Sally Acorn club tagged: sally acorn sonic kiss. That was a real part in Sonic the hedgehog (SATAM)! It was in the last episode I believe. This is disgusting, ewwww! I hate Sonsally and Sally's name turned to Guard Sally Nut!!! Hahaha! Sally is the worstest character from Sonic the Hedgehog!!! Oh yeah! One more thing! I WISH I COULD KILL SALLY!!!!!!!!!!!!!!!!!! @dino123 That's funny nowadays. Because now, Sally seems to be your fav girl. Hmm wow a bunch of Sally haters trashing on a club that there not welcome in hmm I bet they're about 12 years old or around there grow up! warning sonsally hater: I hated that show I almost thow out my tv after that episode!!!!! and dino123 that's not nice to say and for the last time SALLY ISN'T A OFFICIAL SONIC CHARACTER!!!!! !